This is the second part of my post about “exploring OmniOS in a VM”. The first post showed my adventures with service and user management on a fresh installation. 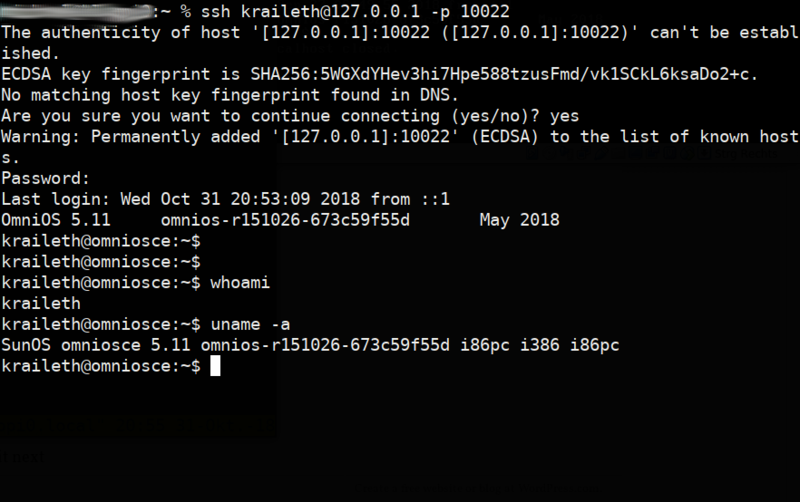 My initial goal was to make the system let me ssh into it: Now the SSH daemon is listening and I’ve created an unprivileged user. So the only thing still missing is bringing up the network to connect to the system from outside. Huh? Only two entries for lo0 (IPv4 and v6)? Strange! 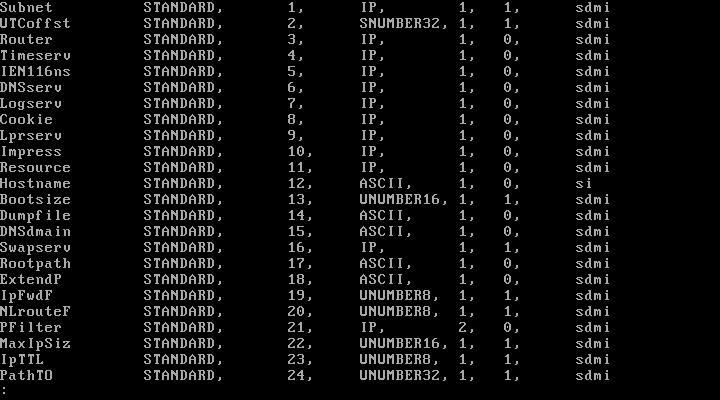 First thought: Could it be that the type of NIC emulated by VirtualBox is not supported? I looked for that info on the net – and the opposite is true: The default VirtualBox NIC (Intel PRO/1000) is supported, the older models that VBox offers aren’t! Obviously it’s time again to dig into manpages. Fortunately there’s a long SEE ALSO section again with ifconfig(1M). And I’ve already learned something so far: *adm commands are a good candidate to be read first. Cfgadm doesn’t seem to be what I’m looking for, but dladm looks promising – the short description reads: “Administer data links”. I must say that I like the way the parameters are named. No cryptic and hard to remember stuff here that makes you wonder what it actually means. Parameters like “show-phys” and “show-link” immediately give you an idea of what they do. And I’m pretty sure: With a little bit of practice it will work out well to guess parameters that you’ve not come across, yet. Nice! 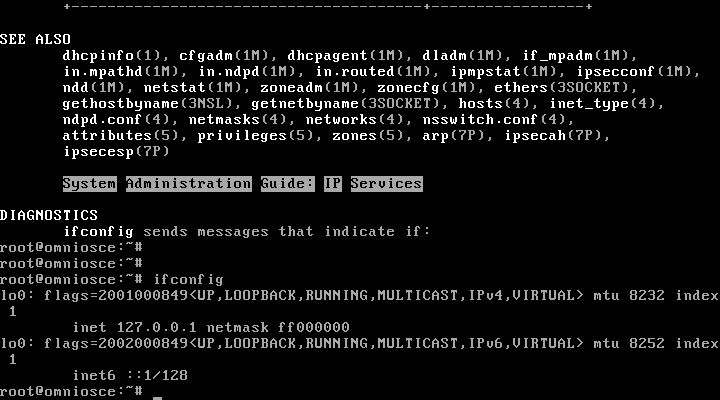 Ok, there we have the interface name: e1000g0. I don’t want to create bridges, bond together NICs or anything, so I’m done with this tool. But what to do with that information? 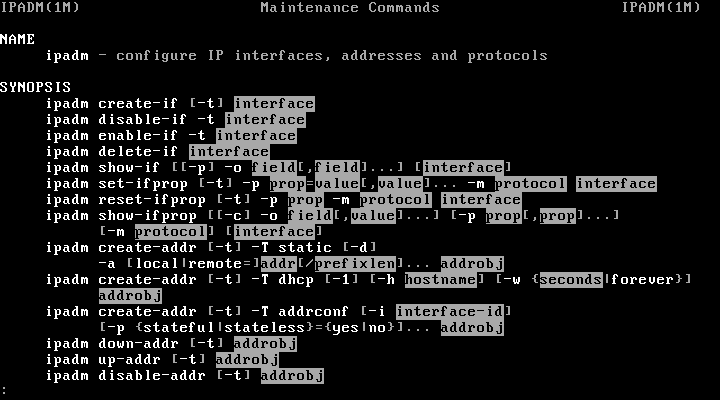 The ifconfig manpage mentions the command ipadm – but it’s kind of hidden in the long text. For whatever reason it’s missing in SEE ALSO! I’d definitely suggest that it’d be added, too. More often than not people don’t have the time to really read through a long manpage (or are not as curious about a new system as I am and thus don’t feel like reading more than they have to). But anyways. No error or anything, so now the system should have acquired an IPv4 address. Ok, looks like we don’t have name resolution, yet. Is the right nameserver configured? Oops. There’s something not right here! 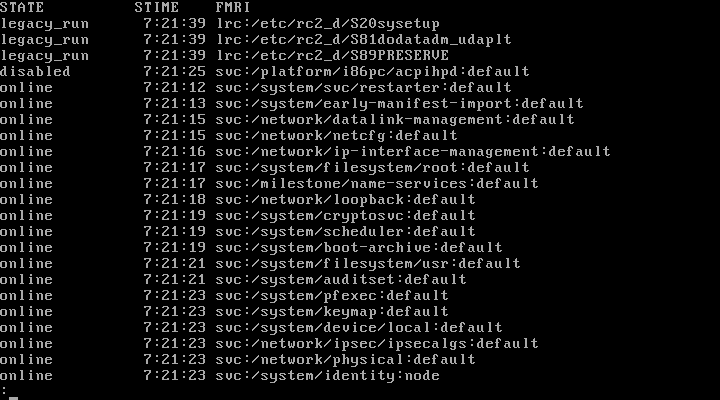 If I configure my FreeBSD box to use DHCP that makes sure resolv.conf is populated properly. 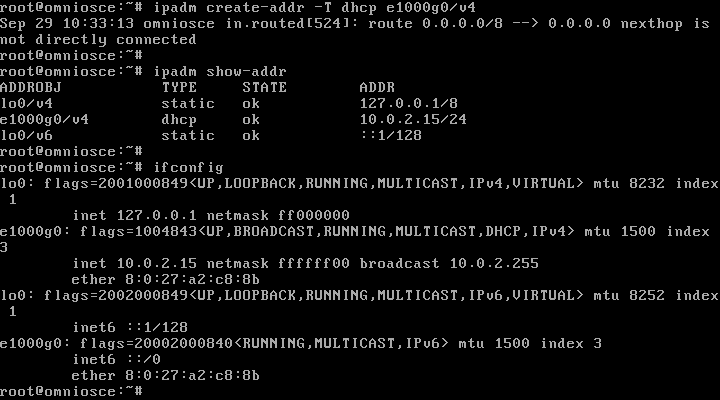 The interface e1000g0 got an IP – so the DHCP request must have been successful. But did something break before the network was configured completely? Is the DHCP client daemon even running? Aside from the IP address, and for IPv4 alone, the netmask, broadcast address, and the default router, the agent does not directly configure the workstation, but instead acts as a database which may be interrogated by other programs, and in particular by dhcpinfo(1). Is the routing information correct? Let’s check. Alright, then it’s probably not a network issue… But what could it be? Eventually I found another hint at the wiki. Looks like by default OmniOS has a very… well, old-school setting when it comes to sources for name resolution: Only the /etc/hosts is used by default! 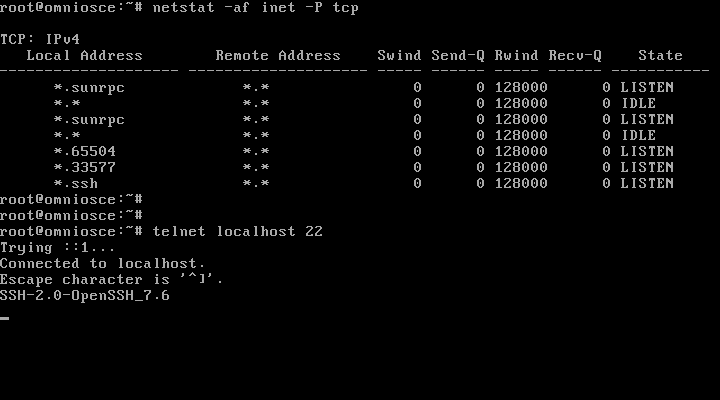 I haven’t messed with nsswitch.conf for quite a while, but in this case it’s the solution to this little mystery. Copying nsswitch.dns over nsswitch.conf should fix that problem. And really: Instead of getting a ping: unknown host elderlinux.org now I get no answer from elderlinux.org – which is OK, since my nameserver doesn’t answer ping requests. 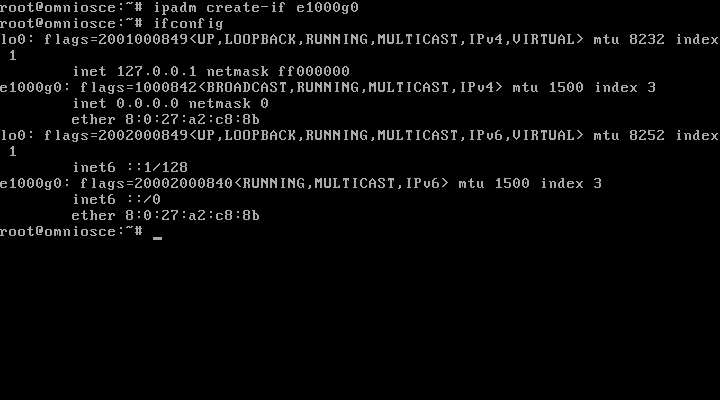 Now with the network set up correctly, it’s finally time to connect to the VM remotely. 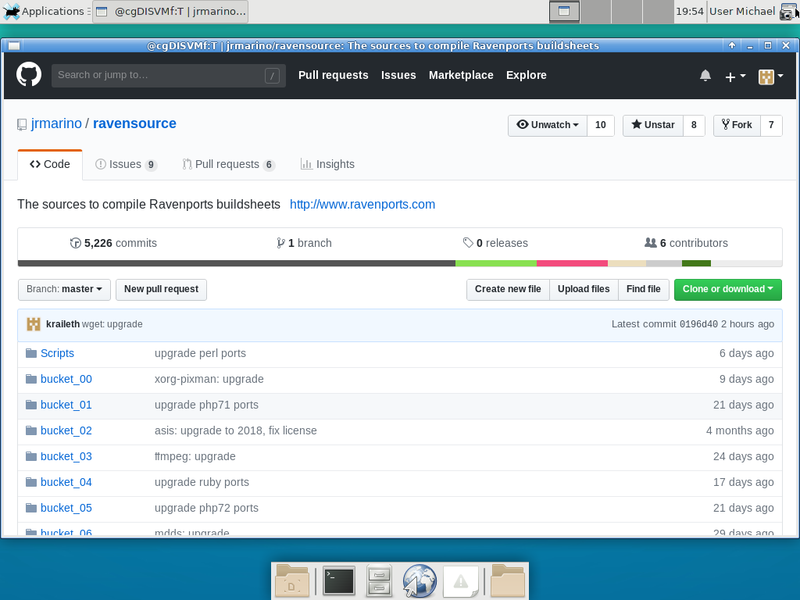 To be able to do so, I configure VirtualBox to forward port 22 of the VM to port 10022 on the host machine. And then it’s time to try to connect – and yes, it works! 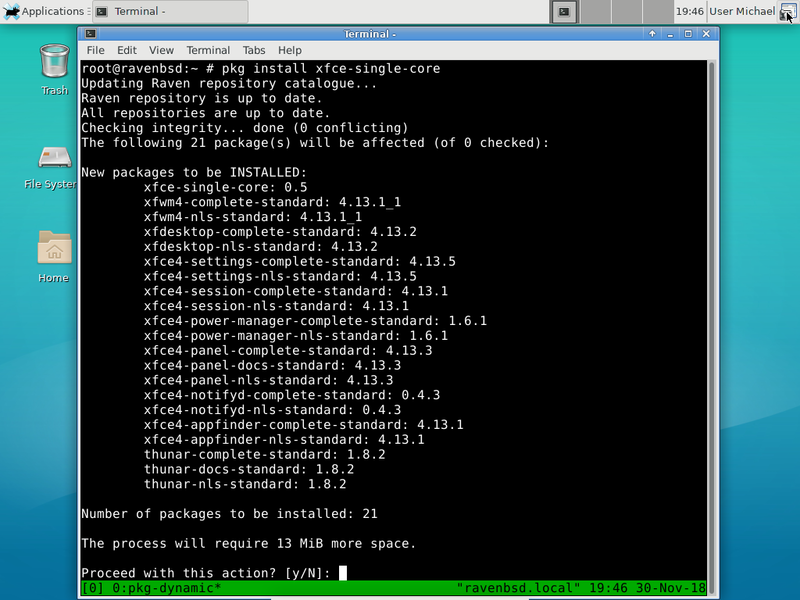 SSHing into the OmniOS VM… finally! So much for my first adventure with OmniOS. I had quite a few difficulties to overcome even in this very simple scenario of just SSHing into the VM. But what could have been a trivial task proved to be rather educational. And being a curious person, I actually enjoyed it. 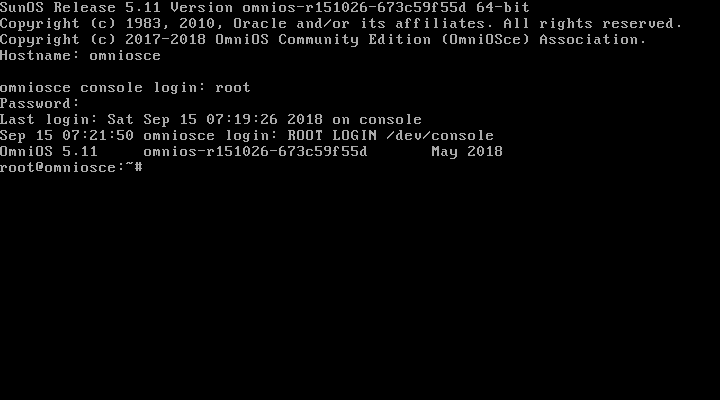 I’ll take a break from the Illumos universe for now, but I definitely plan to visit OmniOS again. Then I’ll do an installation on real hardware and plan to take a look at package management and other areas. Hope you enjoyed reading these articles, too! While I’ve been using Unix-like systems for quite a while and heavily for about a decade, I’m completely new to operating systems of the Solaris/Illumos family. 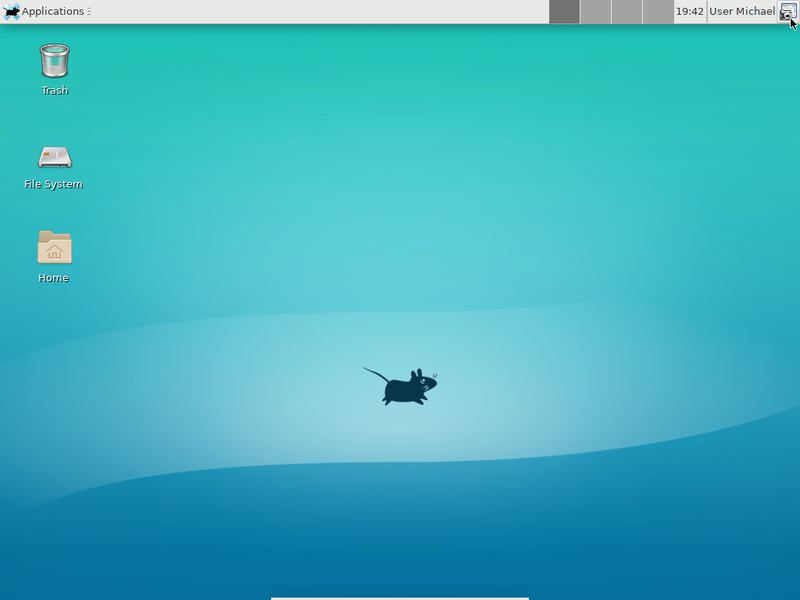 So this post might be of interest for other *BSD or Linux users who want to take a peek at an Illumos distribution – or to the Illumos people interested in how accessible their system is for users coming from other *nix operating systems. In my previous post I wrote about why I wanted to take a look at OmniOS in the first place. I also detailed the installation process. This post is about the first steps that I took on my newly installed OmniOS system. There’s a lot to discover – more actually than I first thought. For that reason I decided to split what was meant to be one post into two. The first part covers service management and creating a user. According to a comment, a Reddit user would be more interested in an installation on real hardware. There are two reasons why I like to try things out using a hypervisor: 1) It’s a quick thing to do and no spare hardware is required 2) it’s pretty easy to create screenshots for an article like this. However I see the point in trying things out on real hardware and I’m always open to suggestions. For that reason I’ll be writing a third post about OmniOS after this one – and will install it on real hardware. I’ve already set a somewhat modern system aside so that I can test if things work with UEFI and so on. Fresh system: Where to go? In the default installation I can simply login as root with a blank password. So here we are on a new OmniOS system. What shall we explore first? The installer asked me which keymap to use and I chose German. While I’m familiar with both the DE and US keymaps enough that I can work with them, I’ve also learned an ergonomic variant called Neo² (think dvorak or colemak on steroids) and strongly prefer that. It’s supported by X11 and after a simple setxkbmap de neo -option everything is fine. 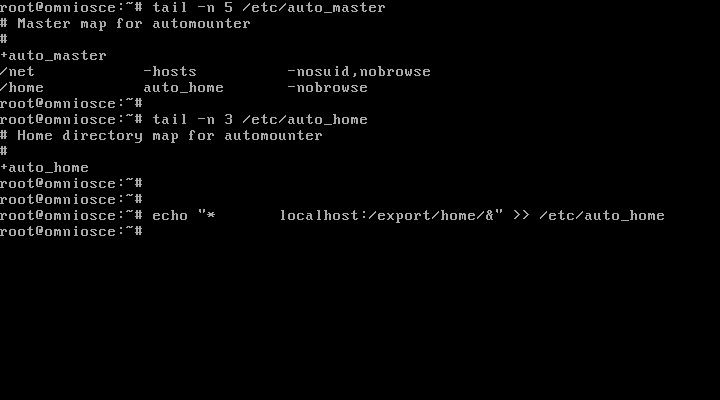 On the console however… For FreeBSD there’s a keymap available, but for Illumos-based systems it seems I’m out of luck. 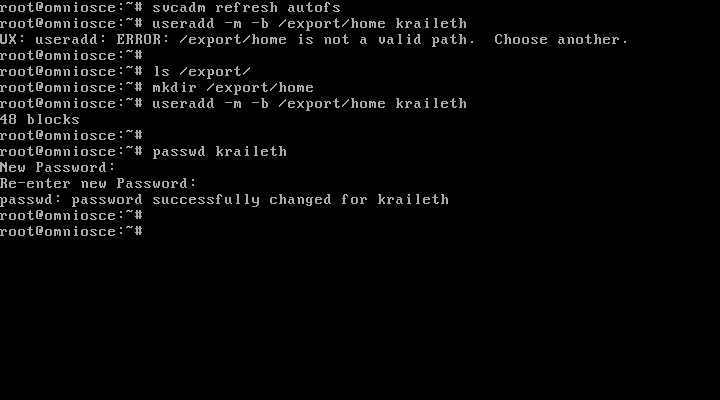 So here’s the plan: Configure the system to let me SSH into it! Then I can use whatever I want on my client PC. Also this scenario touches upon a nice set of areas: System services, users, network… That should make a nice start. During the first startup, smf(5) was mentioned so it might be a good idea to look that up. So that’s the service management facility. But hey, what’s that? The manpage clearly does not describe any type of configuration file. And actually the category headline is “Standards, Environments, and Macros”! What’s happening here? First discovery: The manpage sections are different. Way different, actually! Sections like man1, man1b, man1c, man3, man3bsm, man3contract, man3pam, etc… Just take a look. Very unfamiliar but obviously clearly arranged. The smf manpage is also pretty informative and comprehensive including the valuable see also section. The same is true for other pages that I’ve looked at so far. On the whole this left a good impression on me. 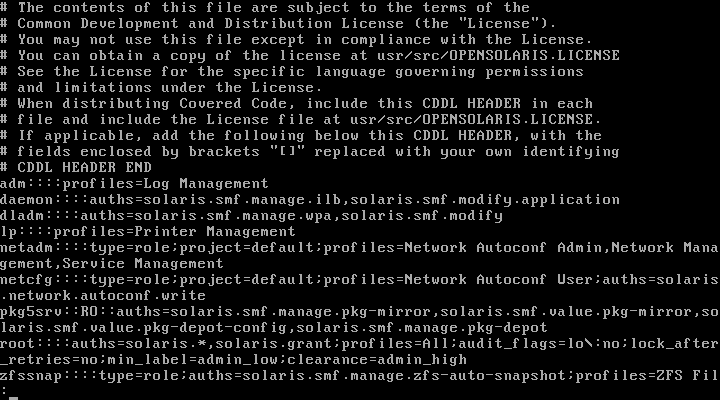 Solaris has replaced the traditional init system with smf and Illumos inherited it. It does more than the old init did, though: Services are now supervised, too. 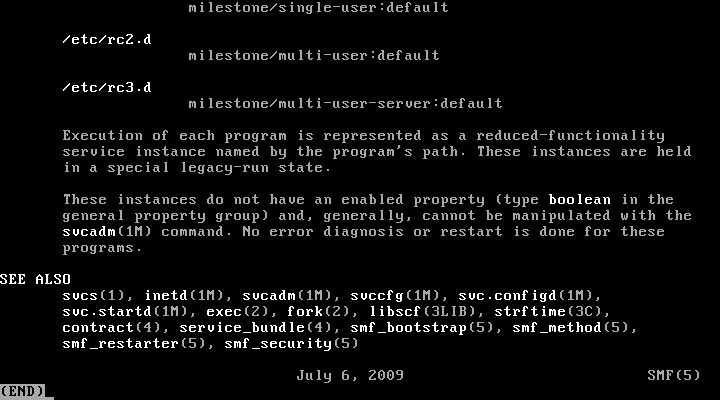 If a service is meant to be kept running, smf can take care of restarting it, should it die. It could be compared to systemd in some regards, but smf was created earlier (and doesn’t have the same … controversial reputation). Services are described by a Fault Management Resource Identifier or FMRI which looks like svn:/network/loopback:default but can be shortened if they are unambiguous. I had no idea how to work with all this but the first “see also” reference was already helpful: scvs can be used to view service states (and thus get an idea about what the system is doing anyway). Yes, right, this is not FreeBSD. One netstat -tulpen later I know that it’s not exactly like Linux, either. Once more: man to the rescue! The output (see image below) looks good. 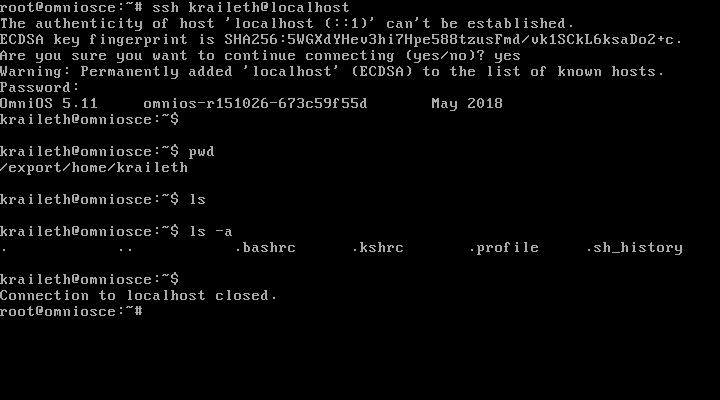 Let’s do one last check and simply connect to the default SSH port on the VM: Success. SSHd is definitely running and accepting connections. Alright, so much for very basic service management! It’s just a test box, but I don’t really like sshing into it as root. Time to add a user to the system. How hard could that be? Ok, there’s no user database like on FreeBSD or anything like that. It’s just plain old /etc/passwd and /etc/shadow. How boring. So let’s just create a user and go on with the next topic, right? UX: useradd: ERROR: Unable to create home directory: Operation not applicable. Uh oh… What is this? Maybe it’s not going to be so simple after all. And really: Reading through the manpage for useradd, I get a feeling that this topic is everything – but certainly not boring! 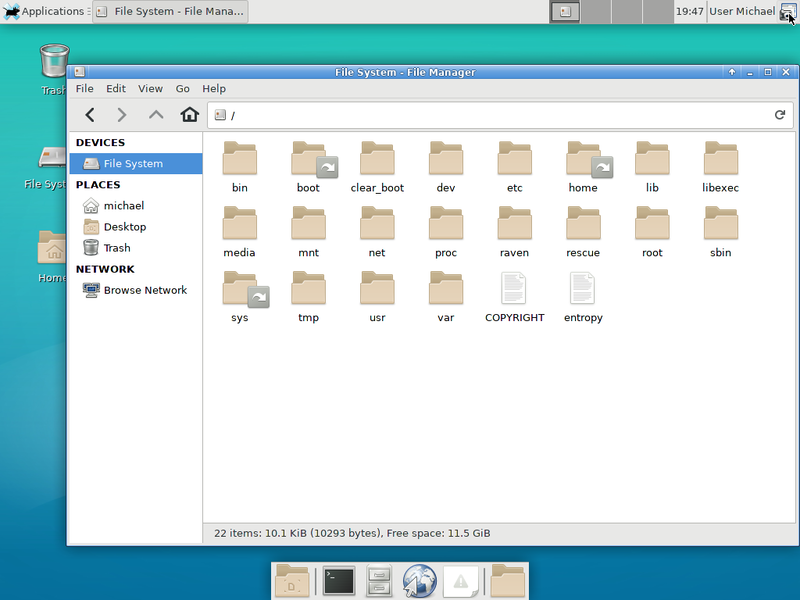 There’s a third file, /etc/user_attr, involved in user management. Users and roles can be assigned extended attributes there. Users can have authorizations, roles, profiles and be part of a project. I won’t go into any detail here (it makes sense to actually read the fine manpages yourself if you’re interested). Now if you’re thinking that some of this might be related to what FreeBSD does with login.conf, you’re on the right track. I cannot claim that I understood everything after reading about it just once. 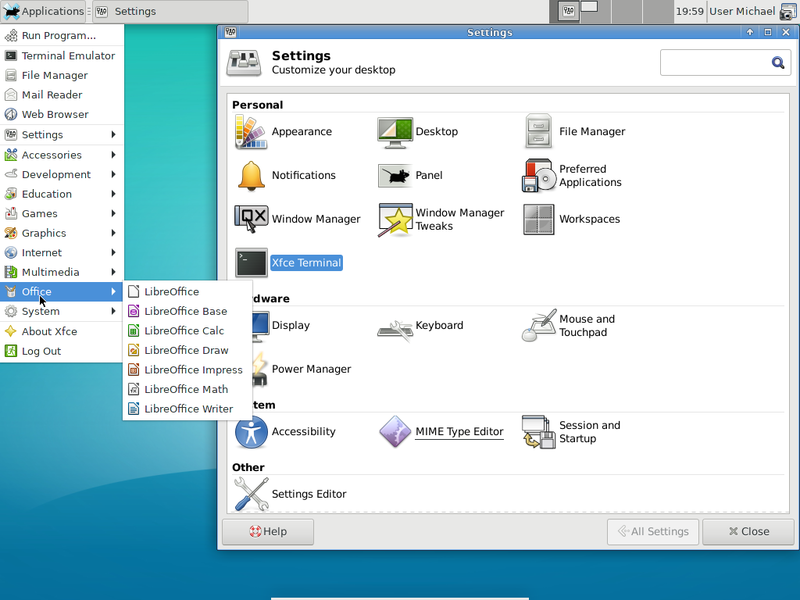 But it is sufficient to get an idea of what sort of complex and fine-grained user management Illumos can do! Ok, while this has been an interesting read and is certainly good to know, it didn’t solve the problem that I had. The useradd manpage even has a section called DIAGNOSTICS where several possible errors are explained – however the one that I’m having isn’t. And that’s a pitty, since some of the ones listed here are pretty self-explanatory while “Operation not applicable” isn’t (at least for me). I read a bit more but didn’t find any clue to what’s going on here. When my man skills failed me I turned to documentation on the net. And what better place to start with than the OmniOSce Wiki? When it comes to local users, the first sentence (ignoring the missing word) reads: On OmniOS, home is under automounter control, so the directory is not writable. Ah-ha! That sounds quite a bit like the reason for the mysterious “not applicable”! That should be hint enough so I can go on with manpages, right? There we go, more pages to read and understand. It seems that people at Sun had the idea that it would be nice to be able work not only on your own workstation but at any other one, too. Managing users locally on each machine would be a nightmare (with people coming and going). Therefore they created the Yellow Pages, later renamed to NIS (Network Information Service). If you have never heard of it, think LDAP (as that has more or less completely replaced NIS today). Thus it was possible to get user information over the net instead of from local passwd and friends. The logical next step was shared home directories so employees could have fully networked user logins on multiple machines. Sun already had NFS (Network File System) which could be used for the job. But it made sense to accompany it with the automounter. So this is the very short story of why home directories are typically located in /export/home on Solaris-derived operating systems: They were meant to be shared via NFS! Success! Now all that remains is bringing the net up. The next post will be mostly network related and feature a conclusion of my first impressions. I hope to finish it next week.